When I travel, eating is always on the agenda and my time in New York has not disappointed. As an additional bonus, I’ve reconnected with old friends and have even made some great new friends through the power of Twitter. 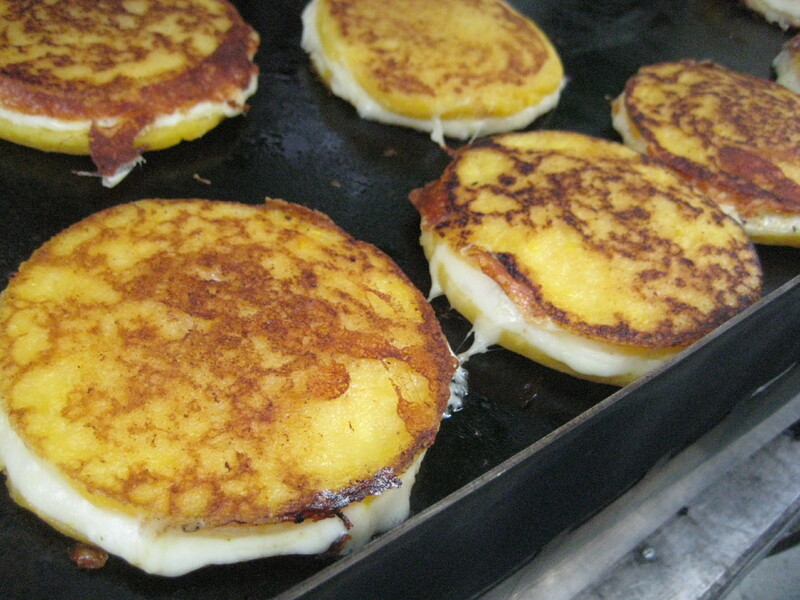 I was introduced to an arepa during a New York city street fair. It’s a Columbian street food and it’s delicious. It is a cornmeal patty that is either grilled, baked or fried. Mine was grilled and there was melted cheese in between the two patties. The cornmeal gave it a sweet taste and it tasted very similar to polenta, but in sandwich form. With Latin America treats on the brain, we decided to tackle a place called Yuca Bar, a funky Latin place that was perfect for a Sunday afternoon. 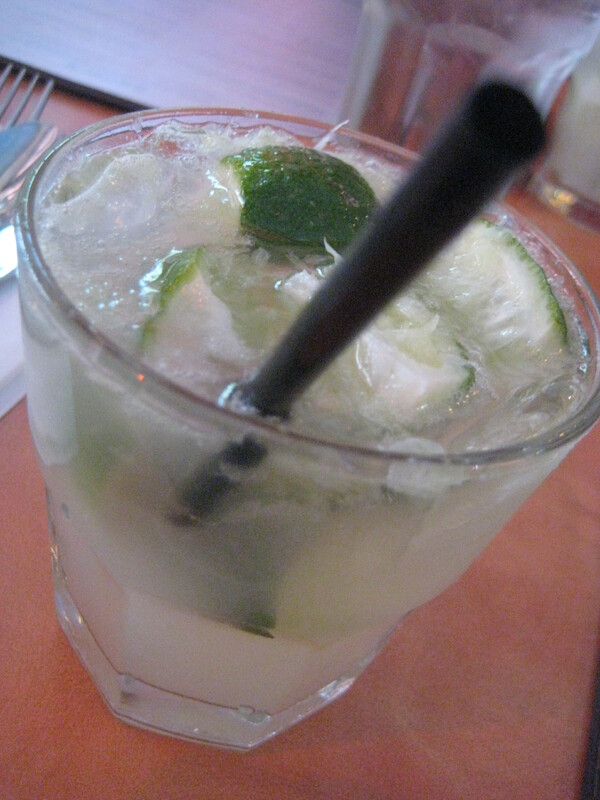 We started with a Caipirinha, Brazil’s national cocktail. My description is that it’s like a mojito, but not really. It has three parts to it, sugar, lime and cachaça which is a liquor made from fermented sugarcane. If you like a strong drink and you love lime, this is the drink for you! I enjoyed it, but I definitely had to wait for the ice to melt a bit to tone down the drink a little bit. A great drink usually calls for some great food and that’s precisely why we chose Yuca Bar. My friend sought out this place because he wanted their yuca fries and chimichurri. My friend (who is Canadian) recently married a Columbian girl and luckily for him, she has introduced her culinary world to him. 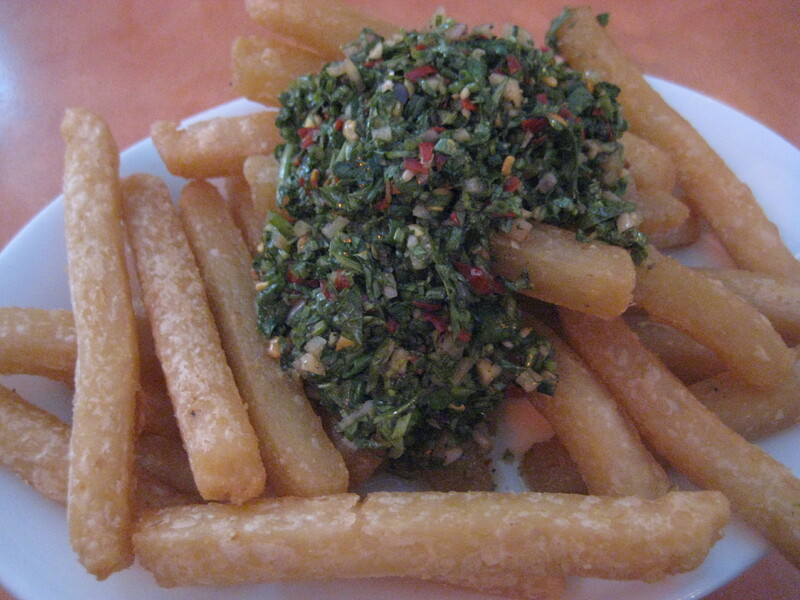 So the results, forget french fries with regular potatoes, yuca fries are where it’s at! They were delicious and crispy on the outside and very starchy when you bite into them, but in a good way. I’ll be searching out some yuca at the market next visit. 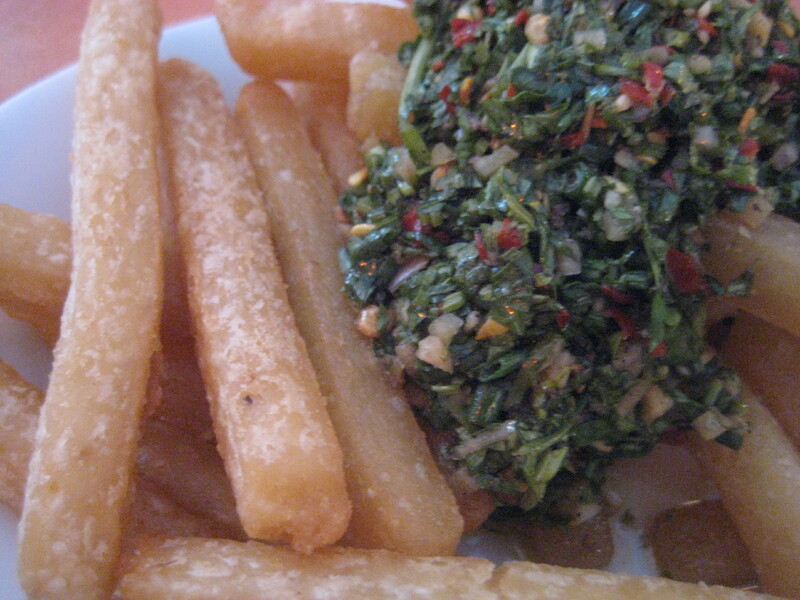 As for this thing they call chimichurri, I was told it originates from Uruguay and Argentina. I would be doing it a disservice to say it’s a sauce, because it’s too chunky to be a sauce. It also is apparently very popular for grilling with steaks. I’m not sure how to describe it, so i’ll be quiet now and let the picture do the talking. I was told that a chimichurri varies from country to country, but they all tend to have parsley, onion, garlic, oil, vinegar. The one we had definitely had some heat to it in the form of a jalapeno. It was probably one of the best things I’ve had in a while and this will definitely get made soon and written about! Thank you for the tour of the city and the introduction to some great food! 111 avenue A @ 7th st.